This luxurious, weighty, off-red cardigan and matching shell followed me home from my favorite ReSale Shop – if you’re a St Louis gal you know the one – but it had a problem. The weight of the knit caused the shoulder area to stretch completely out of shape from the hanger. Fortunately there’s an easy fix – one you can use when you have this same problem. Below you can see the problem – pretty drastic distortion. Start by fitting that shoulder area over the pointed end of your ironing board. This knit was so heavy that I had to pin the edges of the garment into the padded board cover to hold it in place. 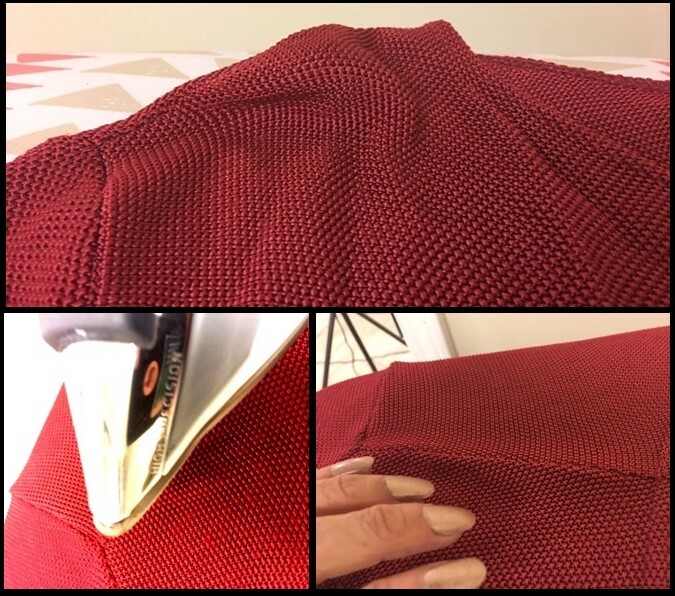 Holding the plate of your iron about an inch above the fabric surface, saturate the area with shots of steam. Then use your fingers to gently pat the knit back into its original shape. Repeat as needed until the fabric is fully recovered. Then repeat the entire process with the opposite shoulder. DO NOT put the surface of your iron down on the knit! Of course I don’t want to encounter this problem every time I wear the sweater, but I also HATE storing items folded in drawers where I don’t see them. I use flocked hangers to hang many of my lighter cardigans the traditional way and they do just fine. But clearly that wasn’t going to work on this weighty knit, so I borrowed a trick from an old “Hints From Heloise” book. Fold the sweater in half along the center front/center back. Now the sleeves are positioned one on top of the other. 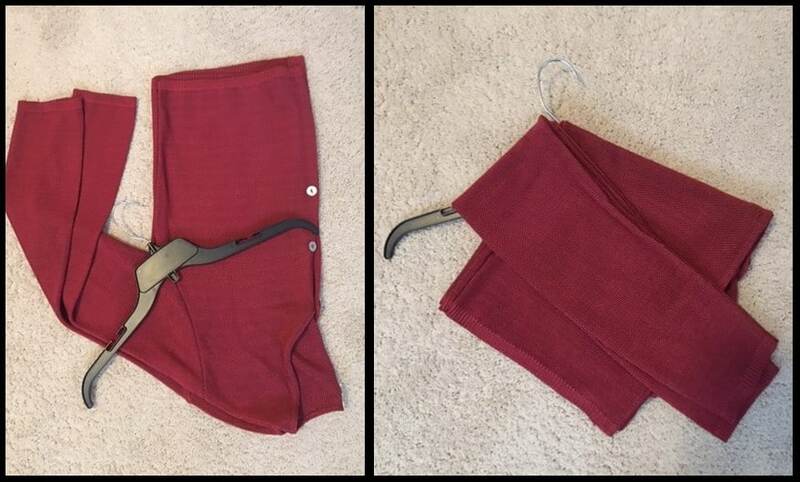 Place a hanger over the upper body portion of the sweater, with the hook at the underarm point. Fold the sleeves down over the other arm, resting on top of the sweater body. PRESTO – the fabric layers cling together and you can hang it right into your closet without worry. NOTE: I usually have the shell on the same hanger, hung traditionally, under the cardigan. But I omitted that here to keep the process more obvious in the photos. You probably know that what you did to the sweater is referred to as blocking–hand knitters do this to sweaters, especially wool sweaters, regularly. They do it to an entire sweater to make the shaping consistent. As some one with slightly longer arms than usual, and as an aficionado of resale shops for unique items, I have used this trick many times on Shetland, Merino and yes, even Cashmere sweaters to alter the sleeves and even the size by up to one size. Wool has a certain amount of give in the fibers due to the corkscrew nature of the fiber, so long as the sweater has not shrunk (e.g. felted) due to a washing fiasco. Wool sweaters have dependably grown a half to a full size** for me, and I have successfully altered many wonderful finds for our New England winters. Generally I have increased the size by steaming and stretching the knit slightly and then pinning large sections to the ironing board as you have, being careful not to move it until it has dried. Sometimes I must re-block at a future date after gently hand washing, but most of the time the sweaters have remained stable even after washing. Many thanks for your various posts…I thought this might help you and your readers benefit by having this “trick” in your arsenal. **Different breeds of sheep/goats have differing amounts of “corkscrew” to their fiber, and it is this corkscrew that you are stretching out, so how much a sweater can be blocked will vary. FYI, Merino in particular is a good bet–the others work, but merino has proven the most flexible for me. My goodness Amanda – many thanks for this comprehensive info – way beyond my simple trick. You rock!